The game Euchre evolved from the card game Triomphe. It is related to the French game Ecarte and the English game Napoleon. Euchre was popular in early America. Four-player euchre is the standard variation, although versions exist for two to seven players. For the four-player game, players divide into two teams of two. The game uses one standard card deck, with all cards valued eight or lower removed. Euchre uses a trump suit. The highest-ranking card in the trump suit is the jack of trump, also called the Right Bower. The jack from the suit of the same color as the trump suit is called the Left Bower, and is the second highest card. 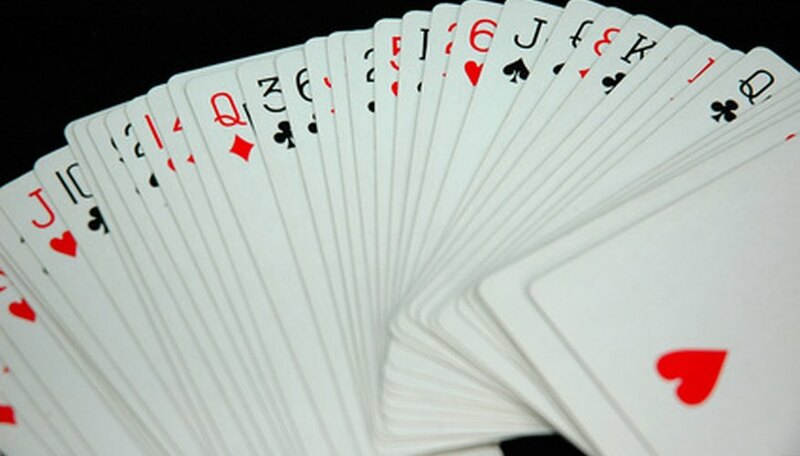 The ace of trump is the third highest card, followed by king, queen, ten and nine. The non-trump suits rank ace, king, queen, jack, ten and nine, with ace high and nine low. The dealer gives each player five cards. The dealer places the rest of the deck face down in the center of the table. The top card of the deck gets turned face up. The upturned top card is the trump suit. The first player can accept the upturned card as the trump suit, or she can pass. If she passes, the next player gets to make the same choice. This continues until either one player accepts the trump suit, or all players pass. If all players pass, the first player gets to name the trump suit or pass. If she passes again, the next player gets to name the trump suit or pass. If all players pass both times, the dealer must deal the hand again. Once a player accepts or names the trump suit, the dealer discards one of his cards. The discarded card is turned sideways, face up, under the deck. The dealer now owns the upturned trump card, but does not put it in his hand. The player who names the trump suit has the option to play alone. If she chooses to play alone, her partner turns his hand face down on the table and does not play. Players must follow the suit led if possible. The highest trump card or the highest card of the suit led wins the trick. The player who wins a trick plays the leading card for the next trick. Players try to win at least three of the five tricks in a hand. If the team that named trump does not win three or more tricks, that team is "euchred". A "march" occurs when one team wins all five tricks. The team that named trump gets one point for winning three or four tricks and two points for a march. If the player who named trump plays alone, the score is one point for three or four tricks and four points for a march. If a team gets euchred, the opposing team wins two points. Traditionally, the four-player game is played to five points.